Is Silenceofmind an atheist troll? Atheist bloggers everywhere might be familiar with silenceofmind (SOM), a Christian apologist serial commenter who appears to believe to know more about what atheists believe (and don’t) than the atheists themselves. SOM uses non sequiturs, kettle logic, arguments from ignorance, red herrings, naturalistic fallacies, etc. etc. ad nauseum. To say that SOM’s comments are endearing, kind, or harmless is to miss the point SOM is trying to convey. Indeed, a fellow blogger, What comes to my mind…, had some pretty scathing words for SOM last month. There is a professor I know who studies how Internet comments devolve (usually into comparisons to Hitler or some other fallacies of irrelevance). His methodology was interesting and compelled me to take a closer look at Internet comments. If I read an article or a blog, sometimes I’ll spend more time going through the comments section than the article or blog itself. Sometimes I screen shot interesting or idiotic comments for future use. SOM’s comments are no exception. But what is most interesting about SOM’s comments is SOM’s refusal to learn from his or her mistakes. The following two screen shots were taken some time apart, perhaps months apart (I don’t time stamp these things. I probably should). In the first image SOM makes many claims about what atheists believe. Apparently all atheists (or even a majority of us) believe in ObamaCare because it’s what the Atheist Good Book says. 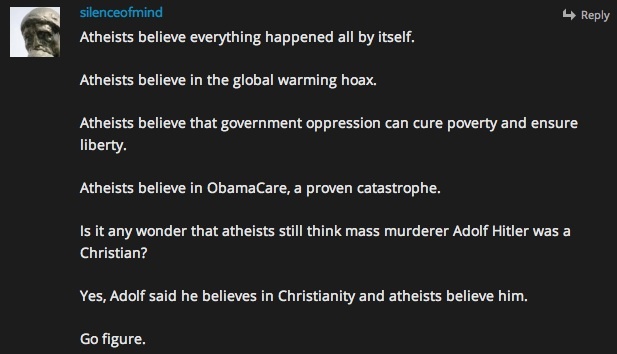 In the second image, SOM again makes the claim that atheists believe that “everything happened all by itself,” which would be like saying, “Christians believe that Jesus was born on December 25th.” Both arguments are wrong. But SOM continues to make these claims about atheists even though I and other bloggers have corrected him/her more times than we can count. To keep making the same errors in logic is a symptom of mental disorder. But there is no reason to believe (other than this weak evidence) that SOM suffers from a mental disorder. Perhaps there is a reason SOM keeps making these mistakes. Perhaps SOM wants to make these mistakes. Proving this claim is a pretty tall order, and I will not attempt to do so. But we’re all familiar with Internet trolls. And I’d be safe to assume that most atheist bloggers are familiar with Poe (a person who pretends to be a religious fundamentalist with the purpose of arousing strong responses). Unfortunately for me, the Urban Dictionary definition (see the link) claims that SOM cannot be Poe unless SOM admits it. Nevertheless, let’s examine some of SOM’s other strange comments. 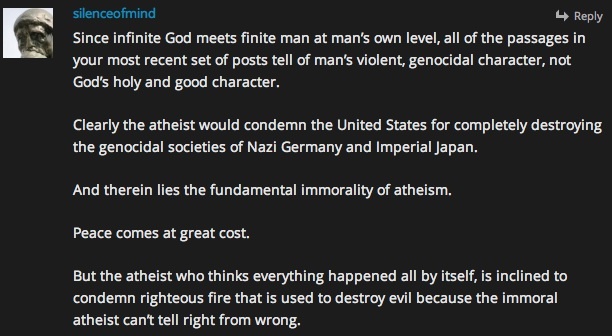 Here, SOM appears to believe that because many skeptics have a problem with OT god’s violence, atheists believe that stopping Hitler and Imperial Japan was wrong. Ie. If we condemn divine wrath then we must condemn human warfare. First, the two are completely different. One was the destruction of innocent people (including babies) because god got pissed off. The other is the destruction of guilty and innocent people because nationalism was threatening the human population on a global scale. War to stop homicidal maniacs, even when innocent lives are taken, is not akin to wanton genocide because your feelings got hurt. I don’t even know where to begin with this one. I’ll allow Santi Tafarella to have the final say here. “Atheist humanists believe that science happened all by itself.” That is probably the most absurd claim I’ve ever heard. It’s one thing (albeit wrong) to say we believe the big bang happened all by itself, but that the actual scientific method just poofed into existence one day is one of the strangest beliefs I can imagine. I have little reason to believe that anyone, even a five-year-old, would make this claim about atheists. Again with the conspiracy theories. And again lumping non sequiturs into an argument. The post from which I got this screen shot had nothing to do with global warming, ObamaCare, or corrupt governments. Trolls generally use non sequiturs to further engage the audience. Again SOM can’t learn that atheism makes no claims about how the universe and world were formed. 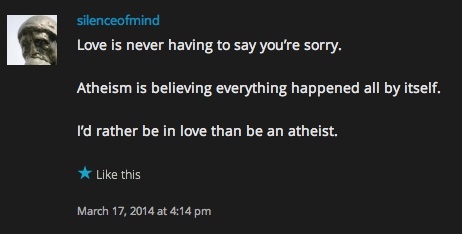 Additionally, SOM appears to believe that you can either be in love (by not saying sorry) or be an atheist. That’s it. Atheists can’t love and lovers can’t be atheists. I find it hard to believe SOM, or anyone, would think this way. This one came from today. This comment shows an even stranger departure from SOM’s usual style. SOM claims to have proven without a doubt that god exists (using three sentences). But the first sentence (you have to be pretty liberal in your definitions to call it a sentence) is merely a claim that god is provable and gay marriage is bad. It doesn’t tell us anything. The second sentence isn’t even a sentence. I assume SOM means you don’t need religion to prove god exists and gay marriage is bad, but I could be wrong (since it’s not even a sentence!). Finally, SOM says reason alone will prove god and the evils of gay marriage. Again, this doesn’t tell us anything, let alone prove anything. I find it difficult to imagine that SOM really believes that claims count as proof. This is an extreme example of what we’ve seen from the usual apologetics. I have little reason to think much about who SOM is. I don’t know their gender, their country, their ethnic background, or even their religion. But I was wondering, does anyone else ever get the impression that SOM is Poe? This entry was posted in Atheism and tagged Atheism, Christianity, Christians, God, Religion, the bible. Bookmark the permalink. 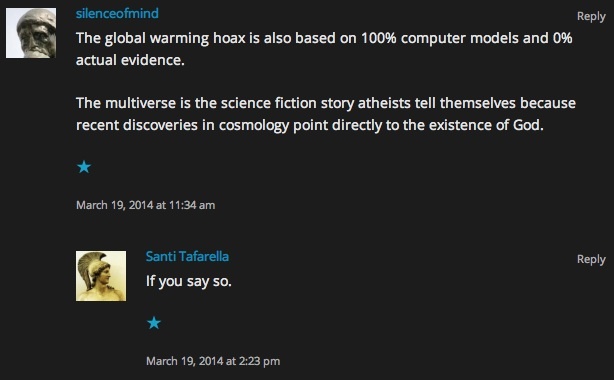 16 Responses to Is Silenceofmind an atheist troll? I know I’ve hit pay dirt when all atheists have left is to call me a troll. That to be an atheist you must believe everything happened all by itself doesn’t originate from me. It originates from atheist physicists and cosmologists. That is stupid beyond belief which means only an atheist would say or believe such a thing. What you have here is an alleged quote from a series. I haven’t seen it so I can only speak in the future subjunctive (ie. “if that were true…” etc). But I won’t. I’ll merely address the problems of your statement. Atheism is merely in its strictest sense a lack of a position regarding theism. (It can and sometimes does take a position, but that is rarely the case). Atheism leaves no room for positions on any other topic. Atheism has no favorite flavor of popsicle. It makes no claims about the existence of gnomes. It has absolutely nothing to say about evolution, cosmology, or any scientific field. Anything outside of the existence of gods is also outside the scope of atheism. One cannot, by any definition of the word, claim that “atheists believe everything came from nothing.” If a physicist said that, then he was speaking as a physicist, not an atheist. I’m surprised that this is so difficult to understand. It baffles my mind. “How the Universe Works,” is on Netflix. My quote comes from the first episode on the Big Bang. The “Everything came from nothing,” quote was repeated multiple times. Great! This is easy. From now on say, “According to ‘How the Universe Works,’ Dr. (so and so) claims that ‘Everything came from nothing. '” To do so is to state a fact (that the physicist made this claim). After that you can criticize the claim, but don’t make claims yourself (that this view is a part of atheist philosophy). Logic is easy. You don’t actually have to silence your mind. The quote was repeated by the various physicists and cosmologists featured in the program. That’s fine. But it has nothing to do with atheism. You’ll be taken more seriously if you separate the two. The program has everything to do with atheism because of the atheists’ unrelenting demand for scientific evidence as proof for the existence of God. You are trying to blame me for atheism being stupid. Sigh. Please let this be Poe. If it is, it is actually quite brilliant. You cherry picked my comments from various posts. The first comment of mine that was used here comes from post that tried to use Adolf Hitler to taint Christians and Christianity. So just like you are trying to blame me for atheism being stupid you are trying to blame me for the Poe-nacity of one of your fellow atheists. Well, the choice is between “incredible stupid Christian” or “troll”. Personally, I go with Hanlon’s razor, but your mileage may vary. In any case, every word spent on him is pretty much a waste of valuable cyberspace. I swing between thinking he’s a troll of some sort, to thinking that some of his basic views could be genuine but he enjoys delivering it such a ridiculous manner just amuse himself and waste people’s time. All you need do is learn to give another the last word. You won’t convince him; if you argue, he will respond; if he does dickish things like replying to every one of your commenters, you have an excuse to ban him. If what I say has value, whether there is something after it does not matter. Not everyone can be convinced, however perfect is your knowledge, expression and rightness. I agree. Usually I let him/her have the final word. But I’m not a fan of banning people. As long as they don’t threaten physical violence or something at that level, I generally allow their voices to be heard (even if they are ridiculous).